European moles have black, velvety fur and a rounded body. Their stumpy front legs are spade-like with sharp claws, and their back legs are small and weak. Moles live throughout Britain wherever soil is deep enough for tunnelling and can create 20 metres of tunnel a day! They feed on earthworms and other soil-dwelling creatures, but not on plant roots. 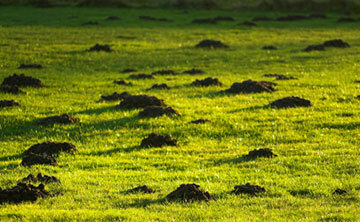 The mounds of earth which they leave behind as they excavate their underground homes are known as molehills. Molehills on lawns must be removed before mowing and collapsed surface tunnels need filling in to maintain a level lawn surface. One method of removing moles is gassing, where we use pellets that emit toxic gases into the tunnel system, however, these cannot be used within 3m (10ft) of occupied buildings. The second method is to use mole traps that are humane, but need careful placement to align them with the direction and depth of the tunnel. No bait is required but it is important to keep disturbance of the earth to a minimum.